Welcome to Baxter Residential Elevators, dba...Nationwide Lifts of Texas. We've been serving the residential elevator and accessibility market in Texas for over 30 years. As part of the Nationwide Lifts family, we offer our customers a locally-owned and operated family-business who specialize in building long-term working relationships with our customers as well as the stability and support of Nationwide Lifts' national brand and presence. Our partnership with Nationwide Lifts also allows us to provide our customers with some exclusive products such as the VISION 830 and the Artesian line of truly one-of-a-kind custom home elevators. We're also proud to offer Nationwide Lifts' industry leading 10-Year Warranty on most of our residential line of products. Whether you need a home elevator for accessibility reasons or simply to add value and convenience to your home, Baxter Residential Elevators / Nationwide Lifts of Texas will work with you, your architect and builder to design the perfect solution for your home. We install and service Residential Elevators, Stair lifts, Dumbwaiters and Wheelchair lifts. We are an authorized distributor for several major equipment manufactures. We are a State of Texas Licensed Elevator Contractor and carry full liability insurance for the installation of residential elevators and accessibility equipment. For more information on our line of accessibility equipment, please choose from the menu on the left. What's new in our business, check out our Attic Lifts and the Hide-Away™ shelter/saferoom. 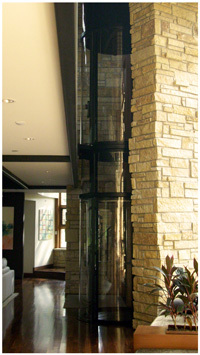 Copyright 2004-2010 © Baxter Residential Elevators, LLC., All rights reserved.